The Wabash world music ensemble Wamidan brought audience members to their feet in more ways than one Saturday as they performed the Bagandan folk dance "Baakisimba" at the 2006 Global Partners East Africa Conference. Several conferees couldn't resist taking to the stage and joining in the final dance number, and the group, comprising students from Wabash College, DePauw University, and Crawfordsville Community Schools earned a standing ovation for their evening's performance. Saturday's crowd-pleasing concert (see photo albums I, II, and III) before representatives of colleges from across the country marked the Wabash group's first appearance before a national academic audience. The concert provided a fitting close to a week of firsts for the Wabash Music Department. On Thursday, Wabash Professor Peter Hulen's composition "Games" was premiered in the College's Salter Hall by the recorder collective Quartet New Generation. That same evening in New York City, Professor James Makubuya played Carnegie Hall as a member of the group Wu Man and Friends in that ensemble's debut performance. 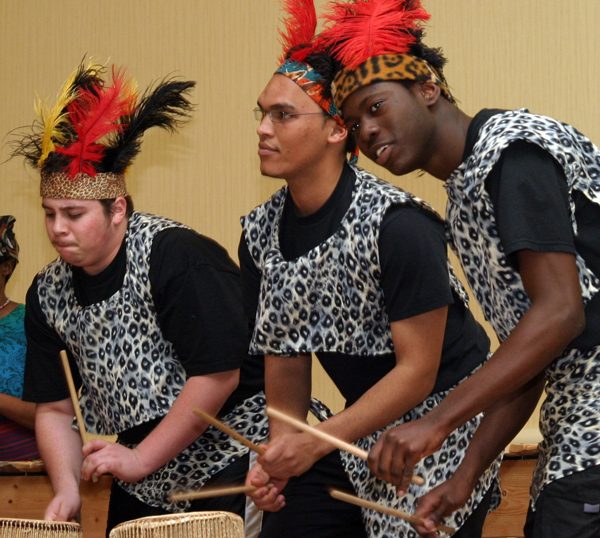 In photo: Steve Hernandez, Bernard Meyer, and Teye Morton accompany dancers on drums for the Acholi folk dance "Larakaraka."